What the United States—and arguably every country—needs more than anything else is citizens. This should not be confused with people who have citizenship, as in too many cases these have little in common. CITIZENS are what we should all become. To be a Citizen constitutes both the minimum and the maximum. They represent the lifeforce of a country, as they are the ones thinking, discussing, and holding accountable those who would lead us. COGS, along with Citizens, form the backbone of functioning societies. Unlike citizens, Cogs are not questioning and contemplating their opinions, and are making them based on group dynamics for the most part, but they are at least engaged in the process even if it is from within a box. ACCESSORIES are arguably the most detrimental group to a society because they look from the outside like they might be Cogs or Citizens, but they’re much more like Barnacles. They work and pay taxes, and are therefore much more practically useful than the Barnacles who don’t, but they do these things mostly because it’s the accepted thing to do, not out of principle. BARNACLES are those who pull upon society without giving back. They consume the benefits of a given society and culture, but they do not contribute. They don’t work. They enroll in public programs, consume food paid for by the cogs and the citizens, often complaining all the while about how broken the system is. Much of my analysis will deal with Accessories, as they are the group that appears most benign while being most malignant. Accessories are the men and women who take pride in their lack of civil participation. They think it’s amusing to know nothing about the world. They think it’s a sign of American superiority that they cannot locate Germany on an unlabeled map. They have no idea who their congresspeople or senators are, and they think people who do are somehow strange. Indeed, the worst part of their condition is thinking that it’s normal, and that it’s to be encouraged or even celebrated. In a strong field, this is likely the worst cancer a nation can experience. Why are children not allowed to vote? The illuminating answer is that children aren’t mentally developed enough to make complex moral decisions. They don’t know enough about the world, about history, about geography, about poverty, about economics, or most other topics that enable good decisions. So what makes them different from accessories? There are millions of men and women in the United States who have no idea who fought in the Revolutionary War, or how laws get passed, or why the Sunni are fighting with the Shia. They have deep knowledge of sports and celebrities and fashion and cars, but know nothing about the world. And those are the ones with college educations. And I suppose it’s fine for someone to choose to live this way. They are at least working and contributing taxes. But we do not have to respect them as adults, and indeed we should not. We can pat them on the heads for being cute or funny or gifted in some particular way, but the one question we should be asking them—just as we ask with children—is what they intend to be when they grow up. The fault is yours. You, more than any other type of contributor, are the Accessory to our nation’s murder. You are wielded like molten cannon fodder of inaction at the weeping remnants of our democracy. And so now it comes to you, dear reader. Which of these are you? 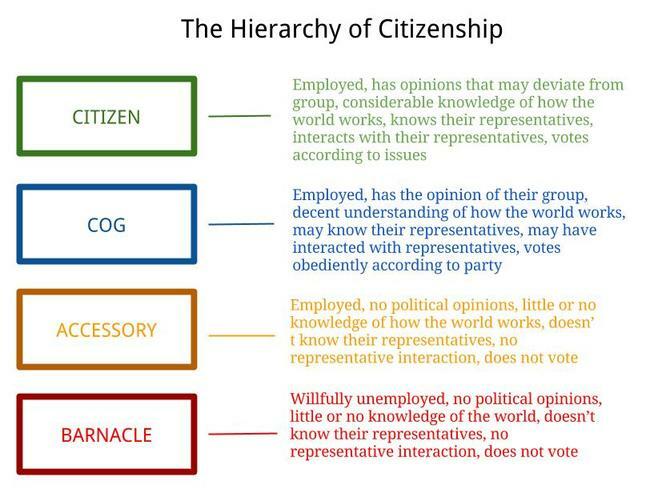 Whether you’re a Barnacle, or an Accessory, or even a Cog, my plea is a simple one: if you are not a Citizen on this scale you need to become one. The nation, and the world, can only survive if more people like you become active participants in the management of the world. Notice I say nothing here of political party or ideology. It matters not. If some Citizen or Cog sits on the polar opposite from me on a spectrum, I at least know one thing: they care about this country and they are actively trying to improve it. I respect that tremendously, and we should all do the same. There are notable exceptions to the Barnacle group, which are those who are actively trying to get out of that state. This would include many millions who want to work but cannot. Another notable exception for Barnacles would be people who intelligently and conscientiously abstain from our society, such as hermits, monks, and the Amish. I may not agree with what they are filling their lives with, but they are at least doing so for actual reasons as opposed to laziness and abstinence. Another temptation for exemption would be full-time parenting, as it undoubtedly contributes greatly to civilization. The reason this cannot be exempt, however, is that most full-time parents are women, we mustn’t give the chauvinists of the world a legitimate reason to exclude women from serious conversation about our future. And that’s precisely what they’ll have if men alone are knowledgable and participating in the affairs of our government. Full-time parents, be them men or women, should know the world, have opinions, and make themselves heard through both interactions with their representation and voting. It’s important to note that lobbyists are plenty involved, but are often the epitome of malignant influence. The focus here is on addressing the millions who don’t participate at all yet still think themselves citizens. There are other groups that abstain from voting because they feel they are completely ignored anyway. I strongly disagree with this viewpoint, and think it ends up helping those in power who are ruining the very system they’re complaining about, but it doesn’t put them in the Accessory group. They’re more like the exempt hermits or Amish on this view. The original form of this diagram was a pyramid, but after hearing good arguments from my friend Carl, I was convinced to change it to this vertical set of rectangles. In short, a pyramid implies too many things that I was not claiming regarding the proportion and relationship of these groups. Thanks, Carl.